MCTRON offers its MaxxZyme® line of targeted enzyme products for use in denim processing and finishing. Our plant personnel have over 50 years of experience in supplying the market and assisting customers with technical support. MCTRON’s MaxxZyme® line of targeted enzymes help enhance performance during garment processing and finishing with unique applications in denim and textiles. Click here for an Overview! 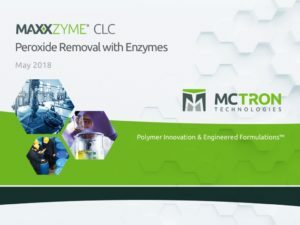 MaxxZyme® CLC is a highly concentrated liquid catalase enzyme used to remove residual hydrogen peroxide after bleaching operations. The product has no adverse effects on the textile fibers or dyestuffs..
MaxxZyme® ACL2X is a concentrated acid cellulase enzyme that is designed to perform well in both bio polishing and denim washing applications. MaxxZyme® NCP is a neutral cellulase powder enzyme that can be run at lower temperatures. Besides being functional at cold temperatures of 20-40°C, it provides high contrast with minimum back staining. MaxxZyme® ADS10X is an alpha-amylase preparation produced using a strain of a non-pathogenic microorganism that breaks down starch and is especially effective for hydrolyzing starch in textile size.